← Choosing a Lampshade: I Choo-Choo-Choose…? So much violence on the surface world, I’m going back. We have an unfinished basement, which is brilliant. Houses in England don’t have basements, so this is a new experience for me. Now, all my English relatives wish they had basements, and they’re jealous of ours. However, there was one problem with the basement, it used to flood after a big storm. Water often came into the basement at the back of the house during heavy downpours. Attempting to prevent this, we fitted new gutters, installed a dry well, and changed the grade at the back of the house. Changing the grade meant raising the ground level next to the house. Which, in turn, meant we had to put window wells around the basement windows to let in light and keep soil away from the windows. put about 4″ of gravel under the window well. The reason for sloping the bottom of the hole away from the house and filling it with gravel are to create an escape route for any water that gets in there. 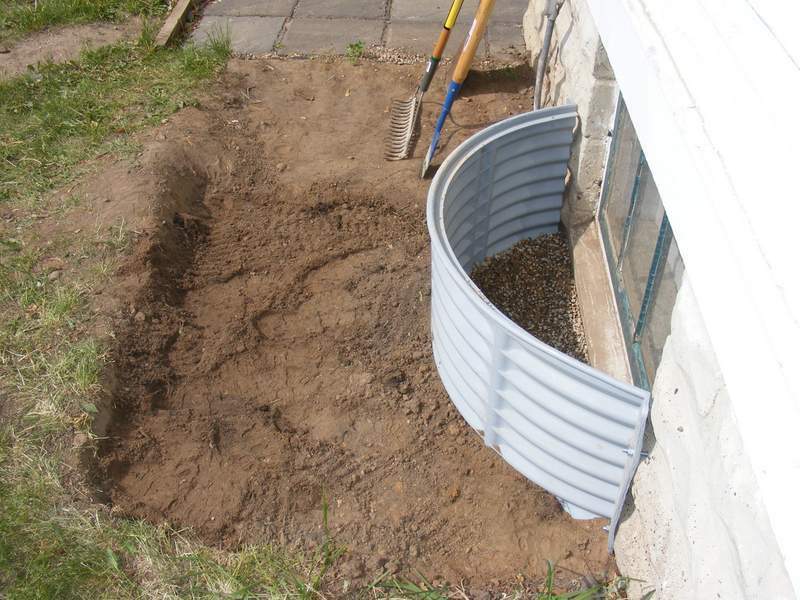 Dig the hole deep enough to allow for a few inches of gravel below the installed window well. 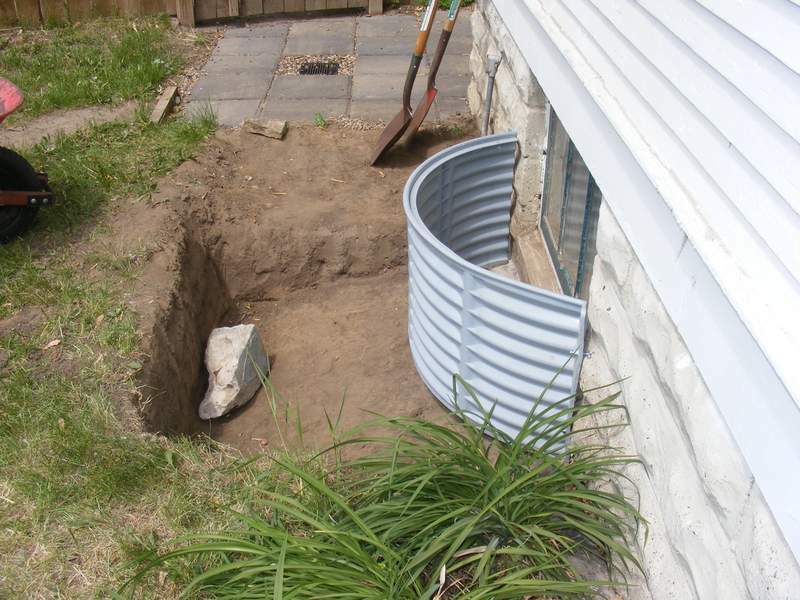 The bottom of the hole should slope away from the house to keep water from infiltrating the basement. Attach the window well to the wall. Then, pour gravel in the hole up to the lower edge of the window well. To keep soil from washing in under the window well, I like to put a bit more gravel inside, almost up to the bottom of the window. Window well installation completed. Notice the the extra gravel inside the window well. On the outside of the window well, put some good quality landscape fabric on top of the gravel, before covering it with soil. The landscape fabric will prevent soil washing down into the gravel and impeding water flow. So there you have it. Once the window wells are installed, you can grade away to your heart’s content. When you go to the home improvement store of your choice, you’ll notice that right next to the window wells are the window well covers. I imagine that these are handy for keeping debris from accumulating in the window well. We don’t have any covers, because we felt they would cut down on the amount of light getting into the basement. The only things that ever accumulated in our window wells were leaves and snow. The leaves are easy to scoop out, and I imagine that snow would also accumulate on the cover. So, it’s up to you. If you would prefer to keep your window well voids void of debris, a cover would be your best bet. But I don’t think it’s an essential. This entry was posted in Construction, Outdoor Building Projects, Windows & Doors, Yard & Garden and tagged basement, drainage, grading, window, window well. Bookmark the permalink.